NOTE: This not-for-profit site's creator, is not accountable for commercials. "... En.ki I have said this before, but it bears repeating..... if somebody says they are a j-rod phoning into some talk show, or if you see a supposedly real picture of a j-rod, you can pretty much figure that it's a fake. There are (to the very best of my knowledge) NO actual photos of any j-rod available - Plain and simple. With respect to your posting about the NASA prediction of solar storms coming around 2012 - I wouldn't be at all surprised. Remember, Dan has said over and over again, we are not dealing with a date per-se, but a matter of physics, as we move through a part of space (bob up through the ridge) that is very highly energetic. That energetic area of space is what we have been talking about - being the potential cause of great catastrophes described in the J-Rod and Orion histories. Hi 61! You're right, some people still don't (or don't want to) understand what Dan was talking about when he wrote "Tell the World" that day on some note paper. People have talked with him face to face, by phone, on IM, on email, and even on the forum, and he told them all the same thing as he said when it all began. Maybe that's the problem. Maybe they all wanted Dan's message to change, so it would reflect what they wanted to hear. (Need an example? One person, who was fixated on some doomsday planet swooping down on us, was determined to get Dan to agree with him. So determined - that he kept trying to finish Dan's sentences off - his own way. Can you imagine repeatedly doing that to somebody you're talking with face to face? Well, this guy had the chance to interact personally with Dan for hours at a time, day after day, pretty much whenever he wanted - and then BLEW IT by trying to manipulate Dan. Dan is telling everybody that: There is a time paradox and we are smack in the middle it. We are currently, right at the point where we can either keep going along our current route (T-1) in which case we will remain united as one humanity, and have to face the results of our own stupidity in contaminating the environment......no free lunch, but at least we will face it together as a united people or take the easy route, use all that fancy looking glass technology that was provided to various greedy governments to 'help us along toward catastrophe' by some not-so-friendly Rogue J-Rod types from timeline-2 (T-2), so that eventually humanity would separate into the J-Rod and the Orion groups. Why? It's because the Rogue J-Rod group (from about 45K into the future) and their Illuminati friends in political power here on Earth today don't give a hoot about us. It wouldn't matter to them. They'd like to see 2/3rds of humanity perish in a catastrophe because it would work in their favor. A catastrophe like that would justify the J-Rod's own history books, and line the pockets of the Illuminati types left in power who side with them. If humanity suffers a catastrophe (and once we would eventually recover) their history books say that we split off into two distinct forms of humanity then go off on different paths (one eventually becoming the J-Rods and going off to Zeta Reticuli and the other eventually going to Orion). This is what justifies their own history. Well, Dan and I (and many others you'll never know) are fighting against that - we are working hard to see that Timeline-2 doesn't happen. Humanity matters. And we all have a chance to make a difference. That's why the seals were collected from the museum in Iraq; to prevent any further proliferation of the stargate looking-glass technology based on the information in those seals, until after we all were safely through the energetic rift (galactic plane). After that, those kinds of devices could be used without triggering a catastrophe. Dan's message was to Tell The World, the importance of what he learned from his experiences - how important it is that we remain united as a people. Of what we could become if we don't stay on track, the T-1 track that is best for our united humanity. Dan's message is that we have the opportunity - RIGHT NOW - to do what's right for humanity. That we can succede, we can avoid catastrophe. That brave men and women are fighting around the world just so we can have that chance.The message is that we are in for a rough ride either way, as we pass through this area of energetic space. That's because we will still have to reckon with the damage we ourselves are causing to the environment, and that's no small matter. Global warming is changing the climate, storms are becoming highly energized, the ice caps are melting, permafrost is melting, ocean life is dying at an alarming rate, the atlantic conveyor system that keeps ocean water moving is slowing down, and if it stops we plunge into a new set of problems.......so no, there is no free lunch. We can help avoid the major catastrophes by preventing the man-made lookingglass technology from proliferating, but we still have to face the results of our negligence against the Earth. Hello Everybody. It has come to my attention that there are a lot of people who seem to be trying to speak for Dan. Taking his words and spinning them off topic, even trying to get other people (who have never been to Area-51, S-4 nor so much as looked at the Clean Sphere where Dan worked with the J-Rod) to comment on the truth of Dan's stated experiences. As far as I am concerned, there is an easy solution. Why not just ask Dan yourself? I spoke to Dan a little while ago, and asked him if he would be willing to speak directly with people from time to time, if they wanted to ask him about the veracity of his statements. He said yes. He agreed to do it out of respect for me. Since Dan completed his orders, he's free to do what he wants. He has repeatedly told me that he does not want to talk about the J-Rod for the rest of his life, and certainly doesn't want to go into the kind of detail he did for the DVD, but yes, he said he would be willing to talk directly with people because of the seriousness of the issues and the fact that they affect people worldwide. So here's the offer. If you don't know what to think about Dan's statements, and if you want to ask him about them directly, just drop me an email. I will give you a phone number to call, and set up a time and date for you to call and I will arrange to have Dan here to speak with you directly at that pre-arranged time and date. Oh, this isn't a one time offer, I'll be keeping the offer open. HE VOWS TO ATTEND THE LAUGHLIN 2007 CONVENTION IN PUBLIC IN PERSON, WITH FRIENDS. TRASH TALKERS AND HOAXERS FLEE FROM BURISCH AND CALL HIM NAMES LIKE, IN THE WORDS OF DR. MCDOWELL, "COWARDS WITH KEYBOARDS"! STAY TUNED AS WE CONTINUE TO REPORT THIS DEVELOPING STORY! DR. BURISCH WILL APPEAR IN PUBLIC TO ANSWER QUESTIONS AND TO MAKE PRESENTATIONS ABOUT HIS LIFE AND WORK. I'll pass the heart wishes everyone. Thank you. Dan's recovery is expected not to take days or weeks, probably months. A lot of emails have come in asking about the Solfeggio publication that Dan and Marci were working on when the seizure struck..."
(continued at www.angelfire.com/pe/peter7/Links/DanBforWhatPurpose.html - "9/26/06"
"... Those who seek power display it unwise, not? Those who possess true power need not deterrent to display. Overt presumption causes weak to over stretch, fall to failure, yes? Subject: Dr. Burisch Mr.'s Deppeller and Garner, I bring you both greetings! I have seized this email address for the purpose of providing you the truth. Not the truth as some have presented it, but the truth in Burisch's, McDowell's and some within MJ12's own words. I am a former member of the Committee of the Majority and have at my disposal approximately 30 pages of diary and communications, concerning what Burisch calls Lotus-2: the deployment of shrimp at Cabrillo Beach, San Pedro, California, USA. Burisch and McDowell have been painted as villains, and this is not the case at all. If you wish I will send the material to you. Please respond if you want it. Worry not, no one can now see what is happening at this address. The truth will be told. Quote: Shady Groves: "These 'guys' are not merely physical but meta physical in nature. That is the only logically conclusion you can come to, to explain what you will see." mjc: It's a plausible conclusion. We all know that Dan_B talked vaguely about an interdimensional race that Majestic has been in contact with regarding the DCTP issues. The way I see it is these entities are either using advanced technology to manipulate things around them, or are using the projective "powers" of their minds, or both. Just my two pennies-worth into the virtual Lost in Space slot-machine. Art: On my Area 51 line, you're on the air, hello. Caller [sounds frightened]: I don't have a whole lot of time. Art: Well, look, let's begin by finding out if you're using this line properly or not. Caller: OK, in Area 51? Art: Yes. Are you an employee or are you now? Caller: I'm a former employee. I, I was let go on a medical discharge about a week ago and, and... [chokes] I kind of been running across the country. Damn, I don't know where to start, they're, they're gonna, they'll triangulate on this position really soon. Art: So you can't spend a lot of time on the phone, so give us something quick. Caller: [voice breaking up with apparent suppressed crying]: OK, um, um, OK, what we're thinking of as aliens, Art, they're extradimensional beings, that, an earlier precursor of the space program they made contact with. They are not what they claim to be. They've infiltrated a lot of aspects of, of, of the military establishment, particularly the Area 51. The disasters that are coming, they, the military, I'm sorry, the government knows about them. And there's a lot of safe areas in this world that they could begin moving the population to now, Art. Art: So they're not doing, not doing anything. Caller: They are not. 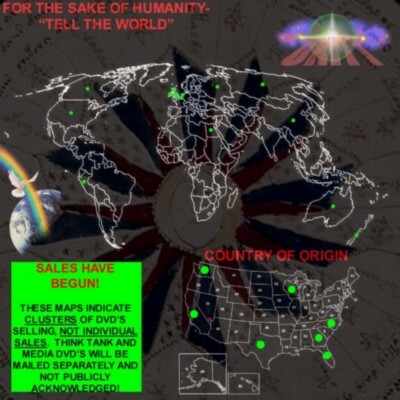 They want those major population centers wiped out so that the few that are left will be more easily controllable...."
Art's radio network engineer later reported that the network's communication satellite lost 50 channels (including Art's feed) at that moment, possibly due to a "lost earth sensor" (so it no longer pointed to the earth station). Art reported that the telephone conversation continued off the air for about a minute, when the caller "screamed" and "screeched" and the telephone connection went dead. Art also reported that his Web site registered 5 million hits just after the outage. 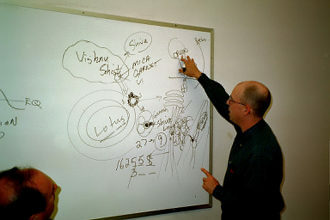 Later, a Tucson caller who he said worked for Hughes (which Art said supplies microwave systems to Area 51) reported that his computer memory and electronic watch were zapped at the same time that the broadcast went dead, and suggested both events may have been caused by a cloud-reflected EMP (electromagnetic pulse, which are created by nuclear explosions or by special EMP generator). A caller claiming he was with Area 51 security said: "[We're] Professional cleaners, you know they dig a lot of holes in the desert...I use a lot of acid....We worked with satellite operations in the Gulf War when we cut down certain transmissions...." He predicted the caller would not be calling in again. ..."
aliens have operational control of parts of Nevada." "...In addition to Corso who claims that the government had been forced into a "negotiated surrender" with extraterrestrials, and of Morris's claims of extraterrestrials residing at the underground Dulce facility,.."
"... The grey and reptilian aliens working together with the military in the underground bases is called MIEC (military industrial extra- terrestrial complex). This is a malevolent organisation, as you shall see with the following information. There are also benevolent ET's on this planet. These groups are not part of the MIEC and are from ...These groups seem to work together in some kind of protective 'federation'..."
The Dow are a small group of Greys that are responsible for many abduction/detentions. They have very little emotional development, but do possess very strong telepathic powers. These powers are often used to deceive and conceal their true motives and objectives. Their race is struggling to assure their own self-preservation but, as of yet, they have not met with any true success ... "
" ... The Dow have their heritage in the system of Zeta Reticuli, ... "
" ... As a small group, the Dow ventured out on their own and were captured by the Orion Group. Genetically altered many times through many generations, the Dow became the slaves and pirates in service to the reptilian species, specifically the Orions and the Draconans ... "
" ... The Dow assignment is to go out in groups as biological and genetic engineers to find underdeveloped worlds and civilizations and then conquer them without force. The Earth fell victim to these plans... "
"... Incredible technology is dangled in the face of this nation or nations in order to get treaties signed giving permission for the Dow to be here and study the life forms, etc. Once this is accomplished, they then slowly take control of the governments that rule the populace and then they become our leaders. Few in the populace really get to know that it has happened..."
" ... Frequently, the elite and/or governments sell out their own races to be, or remain, in favor of their rulers. Once in control, having done so in a most subversive way, the Dow then invite their rulers, the Reptilians and the Orion Group, to the planet to continue the conquest... "
" ... 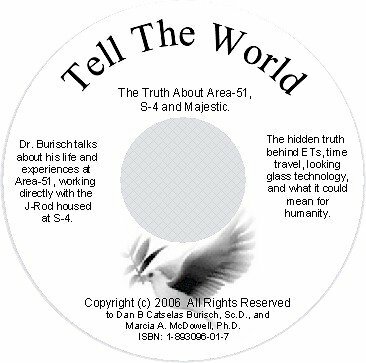 He [Dan Burisch] believes that right now is a time of a fall, and that the rogue extra-terrestrials were involved in the first fall as well as this one, and that this one is a sort of culmination of the first... "
"Art Bell Area 51 call"
"The race of Greys called the DOW".